Oval design award in clear optical crystal topped with silver star. 22.5cm / 8.75in tall. Supplied presentation boxed. A clear-cut winner! These superb awards are handcrafted in flawless, clear optical crystal and topped with a stylish silver plated star. The freestanding design includes a tapered 'wedge' shape with a gentle oval curve. They are suitable for a wide range of presentation ceremonies and fields of endeavour from corporate recognition awards to sports trophies. 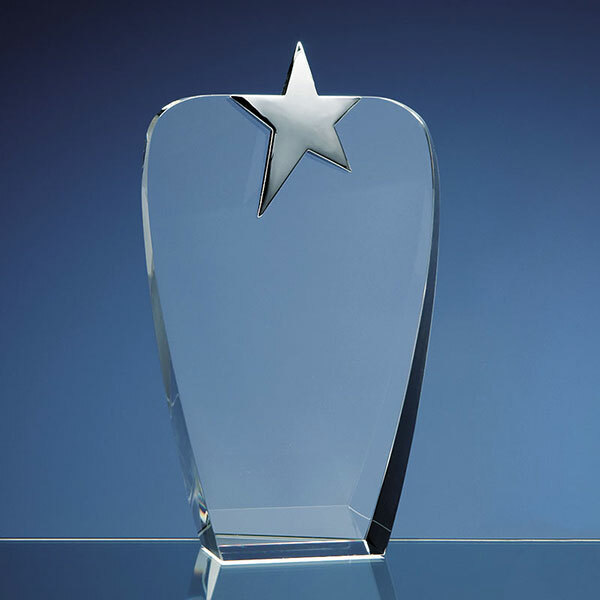 These crystal and silver star awards are offered here with engraving and/or colour print options. Each award is supplied with an attractive, foam-lined presentation box.